Our nation faces a growing demand for creative change in how we educate today’s youth in the subjects of science, technology, engineering, and math. US Sailing is looking to do their part to engage students enrolled at schools and youth programs in hands-on learning opportunities in natural environments, while challenging students to reach higher for academic results. In the fall of 2012, US Sailing launched a national education initiative called REACH. The program connects youth to STEM (science, technology, engineering, and math) education and innovation through the great sport of sailing. REACH provides resources, connections, and national partnerships to youth programs and schools. US Sailing compiled 10 learning modules designed for middle school students. The modules incorporate the national issues of watershed education, climate change, and green technology, as well as hands-on learning both on and off the water. Modules 1-10 are aligned to the Common Core Standards and the framework for the Next Generation Science Standards. They focus on students using experience base learning techniques, and scientific tools to collect and analyze data in their local watershed. The curriculum highlights some of the most up to date research in exploration and online data collection while giving students the opportunity to learn how to sail. The curriculum was comprised from the knowledge and input from educators, scientist, sailing professionals, and engineers, combined with the learning tools and research from national organizations such as NOAA (National Oceanic and Atmospheric Administration) and Sea Grant. The program has had an overwhelming amount of success with over 130 schools and organizations interested in implementation from four countries. As they forge ahead, US Sailing looks to expand the programs, educational materials, develop a teacher/instructor training, and continue to provide resources, connections, and national partnerships. “By providing youth with hands on integrated learning opportunities such as sailing we can inspire innovation in physics, marine biology, robotics, technology and more. Challenging today’s youth makes for a better future,” said Jessica Servis, REACH Program Manager. The REACH program originated from the amazing work of John O’Flaherty, Executive Director of Community Boating Center (CBC) in Providence, RI. Approximately three years ago, CBC approached US Sailing to initiate a pilot program that could be utilized as a model to better connect STEM and sailing nationwide. CBC focused on developing high quality summer and after-school programming utilizing hands on inquiry based learning models combined with sailing as a medium to enhance in-school initiatives and combat summer learning loss. Through the pilot program, the partnerships CBC created with the Providence After School Alliance (PASA), the Audubon Society of Rhode Island, and the Boys and Girls Club developed a model for other sailing organizations looking to partner with local schools to provide ongoing after-school or in-school programming to middle school students. According to O’Flaherty, PASA has been a game-changer for CBC in reaching into the public school system. Additionally, much of CBC’s STEM and inquiry-based learning was born from PASA initiatives. PASA has been successful at connecting professional educators with informal community based program providers and recognizing that each side has a mutual objective. CBC’s work with PASA has been nationally recognized by major funders and charitable organizations. Many of the youth-centric program models and quality standards that CBC helped incorporate into REACH were informed by PASA best practices. There are many different ways REACH can be implemented. This summer many programs will select a few easily integrated modules for use as rainy day activities for students. Instead of sailing quizzes, kids will build wind anemometers, collect and analyze data and draw conclusions about local wind patterns to start. For other programs, REACH will be implemented as an after-school program meeting two to three times a week, covering six to eight modules in a six to eight week time period. For a few of their programs, REACH will be implemented in classrooms during the school day covering all 10 modules. For programs looking to implement REACH, CBC is a good model to strive for. After three years, they work with both highly structured summer programs within the Providence public school system and more informal after-school initiatives with local organizations like the Boys & Girls Club. Their sailing programs utilize US Sailing’s REACH modules to offer a dynamic learning experience that is much more than a programmed boat tour or one-time field trip. They focus on fun, hands-on learning that introduces science, math, and learning concepts in an “under the radar” approach. They engage students not only as sailors, but also as life-long environmental learners. Given the crisis in today’s educational model, sailing programs have an opportunity to effect change. 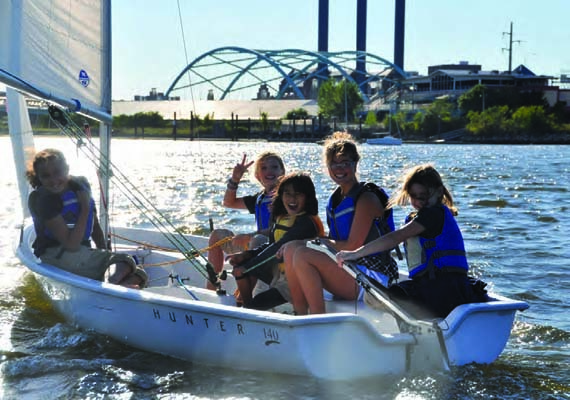 Answering the call for education reform, sailing programs can combine REACH’s STEM content with unique on-the-water training in after-school, summer, and community partner learning experiences. If you would like to learn more about US Sailing’s REACH program, please visit reach.ussailing.org or contact Jessica Servis, REACH Program Manager, at jessicaservis@ussailing.org. For donations to CBC or the REACH program, please contact Jessica Servis. Junior sailors: Don’t miss the Good Luck USA Olympic and Paralympic Send-Off presented by Maclaren!